Slip out of slushy Sundays and into an island state of mind with this new modern oatmeal blend of authentic whole shredded Filipino coconut and California almond slivers. 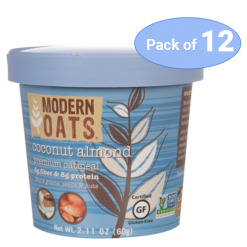 Modern Oats Coconut Almond comes in a pack of 12 perfectly sized cups to provide you with all the nutrients you need to start off your day. 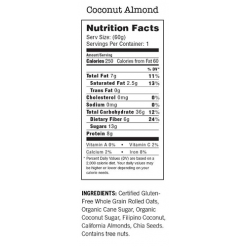 But the benefits of Modern Oats Coconut Almond are so abundant that they can just as easily be used as a afternoon snack or taken with you on an outdoor trip. Hot – Add hot water to cover oats. Cover and steep for 3 minutes. Stir well. Savor. *for firmer oatmeal, do not microwave. Cold – Cover oats with milk or milk substitute. Stir and enjoy. Modern Oats mission is to provide fast food, only better. Modern Oats is made from gluten free certified, small farm whole rolled oats, and blended with antioxidant rich berries, nuts, chocolate, and more… Superfood Super Fast! What is so modern about Modern Oats? 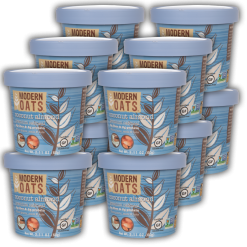 Modern Oats is made by selecting only the most nutrient & protein rich, non-genetically modified, pesticide free, gluten free certified, whole rolled oats. These are the highest grade from smaller, family run operations throughout the upper Midwest of North America. After selecting the oats it is then blend with the finest, juiciest, antioxidant rich super fruits, omega 3 rich nuts, and seeds. Lightly sweetened with only evaporated cane juice, crafting the most delicious, healthy, modern blends of oatmeal found today.